Correctional agencies’ inherent emphasis on security and safety also creates barriers to involving family members in programming delivered within prison walls. Any contact or exchange of information between incarcerated individuals and non-incarcerated individuals is potentially problematic from a security standpoint and requires monitoring by correctional staff, which, in a time of increased prisoner populations and decreasing funding for prison staffing, has the potential to strain both budgets and individual staff members (Lawrence et al., 2002). Facility staff may view family members as both an inconvenience and a threat to security; as a result, they are less likely to be encouraging of new programs that bring family members into the prison, and may treat participants in existing family programs in a manner that subtly discourages their continued participation (Bobbit and Nelson, 2004). 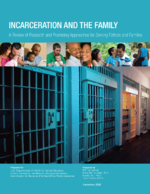 Geographic distance from prison, busy schedules, and tenuous relationships serve as barriers to family involvement in prison programs. Tenuous relationships between incarcerated fathers and their partners may cause partners to be reluctant about attending relationship programs (Nurse, 2004). Relationships are also likely to dissolve over time while fathers are incarcerated (Holt & Miller, 1972), so recruiting of couples in relationship education or counseling programs may be challenging. Additionally, partners and spouses often live far away from the prison facility, making it difficult to deliver services to them (Bobbitt & Nelson, 2004). Mothers often have busy schedules around employment and childcare that prison programs cannot always accommodate (Bobbitt & Nelson, 2004; Markman et al., 2005). Partners also may have criminal histories which preclude their visitation to prisons. Supports and incentives that mitigate these barriers, such as free childcare, transportation support, food, or small monetary incentives, are likely to improve recruitment and retention of family members in programming (Coatsworth, Duncan, Pantin, & Szapocznik, 2006). Furthermore, it is often difficult to recruit children to participate in programs with their fathers, because their mothers or caregivers are required to consent and provide transportation and may not be supportive of the father having a relationship with the child (Hairston, 2001; Palm, 2001). As with partners, children’s school or activity schedules may not coincide with the available times for program activities (Bobbitt & Nelson, 2004). This may limit opportunities for fathers to apply the knowledge they gain in programs to interactions with their children (Harrison, 1997). Thus, an important next step is to investigate approaches to delivering marriage and parenting programs that address some of these barriers. Even if barriers prevent partner involvement, research suggests that marital education programs delivered to prisoners without their spouses may still have beneficial impacts on their relationship attitudes and skills (Kaslow, 1987).